Posted on March 25, 2012, in California, Floral Friday Fotos, haiku, Haiku Heights, I Heart Macro, Macro Flowers Saturday, Macro Monday, Mellow Yellow Monday, Postcards from Paradise, Shadow Shot Sunday 2, Southern California, Straight Out of the Camera Sunday, The Thursday Think Tank, wildflowers. Bookmark the permalink. 44 Comments. That is a gorgeous view of the poppy – such a striking image. Love the pop of orange against the green! Love it, the color is so strking! What an awesome shot. The color is so vibrant! Great photo. Poppies are so pretty, but they don’t stay around long. I have a small area in my yard where they pop up, but it is the same area that becomes a creek after a rain, especially a hard rain, so they don’t last long at all. But what a lovely burst of light it is! I love that yellow! love those poppies and the red ones, too! SO pretty! That is the way life is. Here today and gone tomorrow. Must enjoy the beauty of the day. Poppies lack endurance! Yes. But how beautifully they glow while they’re here. That’s such a pretty flower. Good job as usual, MMT! I am trying to figure out exactly how you DID that?!?! Such a joyful color! I love it. Love the focus on this beauty! Great haiku too! That is truly beautiful. Like it very much! Beautiful…I haven’t seen one of these in eons. And guess what…this would be a fantastic shadow shot also. Here’s my Macro…come on over and see if you can see the ‘WAVE DRAGON’ in glass. Happy Monday!! A colourfull and great post! 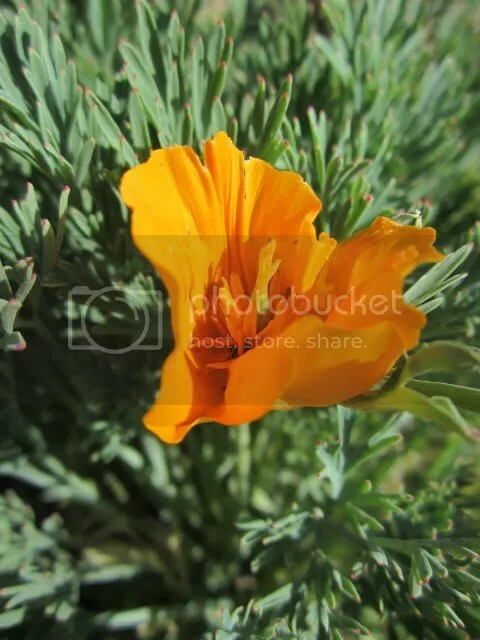 Calling by as another Macro Monday participant, Californian poppies fleetingly beautiful I agree. This is such a great photo! Fleeting for sure ~ much like our daffodils that were here one minute & fried by the gorgeous sunshine’s heat the next! Enjoy them while they last!! What a lovely flower. Have a fabulous week. Gorgeous flower and can be used for medicinal purposes too! Maybe some ‘beauties’ are not meant to endure. Lovely yellow! Sorry for the late visit. My internet was acting up. Have a great week. This just remind me to plant the seeds now so I would enjoy the beauty of poppies this summer. They are so welcome for even the shortest time. Lovely photo and special Haiku to match. This is really something. Beautiful picture along with the haiku … a great haiga. I guess what they lack in endurance they make up for in beauty! So true. And they are so beautiful… Just like your haiku! The wild flowers are just gorgeous aren’t they. I have never seen a poppy this colour, we have the red and oh so many other varieties of flowers that open for just one day and sprout a new bud to open in the sun of tomorrow. South East Spain. Lovely photography and haiku. Terrific haiku, I especially like the placement of the cut mark — it really sets off the contrast in the poem. It’s very sad but true… and very beautiful!!! Thank you for sharing this beauty!! !